Listed below are the Bullseye glasses that contain more than 1.0% lead or more than 0.5% cadmium. 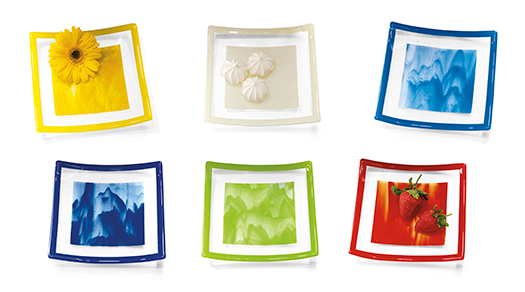 If you use any of these styles for food-bearing objects, we recommend capping them with Bullseye clear glass. In our testing, we have found that clear-capping results in minimal lead and cadmium leaching -- well below FDA limits. In our testing, we have also found that transparent glasses leach lead/cadmium at levels below FDA limits, and much less than opalescent lead/cadmium-bearing glasses; so you may be able to use transparent lead/cadmium-bearing glasses without clear-capping. Our testing, however, does not cover all glass styles or firing conditions, and it cannot be taken as a guarantee of food safety when using these glasses. If you sell food-bearing objects, it is your responsibility to have them tested, since lead/cadmium leaching can be affected by the specific processes to which the glass is subjected. A heavily textured surface, for example, has more total surface area and, therefore, more area from which lead/cadmium may be leached. A local chemistry lab should be able to perform the necessary test for you, according to ASTM C738-94(2006) Standard Test Method for Lead and Cadmium Extracted from Glazed Ceramic Surfaces, for a relatively low fee of around $30 to $70 dollars per sample. Some of our Collage sheet glass styles include streamers made with styles in the cadmium lists above.